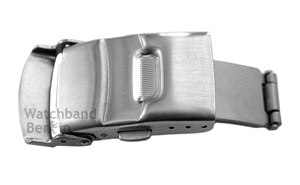 This is a description of how our deployment clasp for leather watch bands (photo 1) works. These clasps have a safety flap (photo 2) and two lateral buttons. In order to open it, you must unfasten the flap and subsequently push the buttons. Now you can put the watch on your wrist. 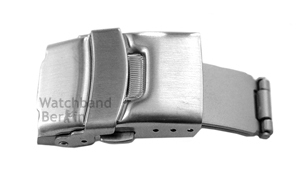 The strap will maintain its circular form, only the clasp folds out, enlarging the size of the strap. The advantage of this type of clasp is that you can put on and take off your watch very quickly. 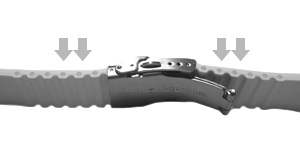 In order to fit the deployment safety clasp, you must slide the perforated side of the strap through the slot-shaped opening on the clasp (photo 3) and then pull the strap until you reach the desired size. Finally, you will only have to secure this end of the strap to the pin found underneath the clasp by applying a slight pressure (photo 4). Through the pre-punched holes you can find the suitable size for your strap quickly and without effort. The length of the watch band can be regulated at any time. This is, however, not advisable after wearing the strap for a long time, since the leather will have taken the form of the previous adjustment. Our deployment safety clasps for silicone bands do not have a pin underneath. The strap is in held in place by a spring bar on each side of the clasp and it can be cut to adjust the length. Our silicone straps, therefore, have holes for the spring bars spaced at intervals of 1 cm. Please note that both sides of the strap must be uniformly shortened, otherwise the clasp would not be centred under your wrist. 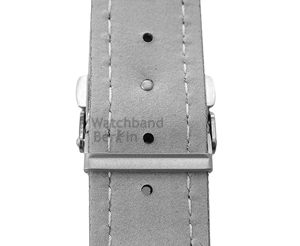 The deployment safety clasp for silicone watch bands, exactly like the one for leather straps, has a safety flap and two lateral buttons. 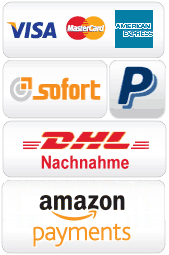 To have a detailed functional description see the sections above. 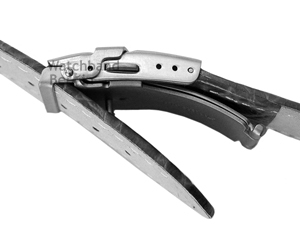 If you want to reduce the strap by 4 cm, for instance, you will have to cut 2 cm on each side. The cuts will not be seen, since they will be hidden by the clasp itself.